This is a `unique' book on Computational Fluid Dynamics (CFD). 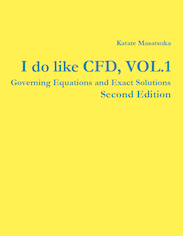 The first half `talks' about governing equations ranging from simple model equations used for algorithm development to the full Euler and Navier-Stokes equations in various forms with complete eigen-structures. Basic materials such as vector identities and coordinate transformations are also included for better understanding and manipulating the governing equations in various forms. The other half `talks' about methods for deriving exact solutions and numerous exact solutionsreadily employed for accuracy verification of a CFD code. This book can be very useful for students studying basics of CFD as well as researchers working in CFD as it contains lots of information that can hardly be found in other CFD books. Softcover. 303 pages (299 in PDF), 8.5" x 11", perfect binding, white interior paper, black and white interior ink (color in PDF), white exterior paper, full-color exterior ink. Published on October 1, 2013. Published at Lulu.com, the world's largest POD publisher. Visit the I do like CFD page at Lulu. This is a full PDF version with hyperlinks on equations, secitons, and references.